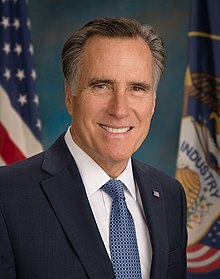 Willard Mitt Romney (born Mairch 12, 1947) is an American businessman an politeecian senator frae Utah since 2019, wha served as the 70t Govrenor o Massachusetts frae 2003 tae 2007 an the Republican Pairty's nominee for Preses o the Unitit States in the 2012 election. ↑ Kuhnhenn, Jim (August 14, 2007). "Romney Worth As Much As $250 Million". The Washington Post. Associated Press. This page wis last eeditit on 7 Februar 2019, at 22:10.